Latest release from top-selling artist in the new age/Reiki genre. A global mixture of instruments includes Chinese erhu, Japanese shakuhachi flute, East Indian tamboura, and Tibetan singing bowls. Takes the listener on a serene, mystical voyage through a variety of peaceful soundscapes with a relaxed and soothing pace. Koyasan is a mountain in Japan, and is the home of the Shingon sect of Japanese Buddhism. There are hundreds of temples in the vicinity, and overall is a beautiful place to visit. Reiki is a fairly modern invention, also originating in Japan, which explains that there is a limitless life force ("Ki") in the universe that can be controlled with the proper conditioning of the mind and body. Reiki has no obvious connection to Buddhism, so I'm not going to go into it here, but it is an interesting "spiritual" practice worth a look if you are interested.. So what do these two terms have to do with us? 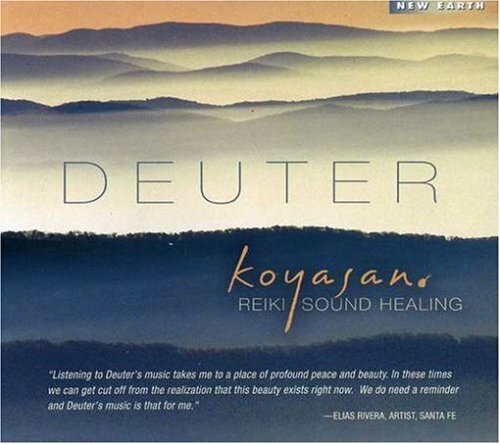 They set the stage for Deuter's latest instrumental/meditation CD, Koyasan. Deuter's music has obvious Eastern influences, with Japanese instruments such as the shakuhachi flute and koto, as well as others from mainland Asia, such as the Tibetan singing bowl. There are, of course, piano and more traditional instruments included in the arrangements, but if you want to meditate and pretend that you are sitting on Mount Koyasan, you can do that. As I did my research for this review, I found that Deuter has put out dozens of CDs similar to this one. I am not going to comment on whether this is better or worse than his other work, simply because I am not familiar with his other CDs. I would go so far to say this is an excellent "first meditation music CD" to pick up, and I plan to pick up more of his work in the future. The eight tracks on the CD are all fairly long, running 8-10 minutes each for the most part. There is no noticeable tune or rhythm to any of the songs, yet everything feels right, and sounds good. It's relaxing without being distracting or jarring, and makes an excellent backdrop to meditation. If you live in a noisy area, playing this while meditating can block out the noise without being too distracting. After a few moments, you stop mentally hunting for a tune and just go with the sounds, gently, calmly, taking whatever comes, and letting it go again. With over 60 albums in a nearly 40-year career, you might be forgiven for thinking the artist's best work has already been written and recorded. And in many cases you'd be right. But not so with Deuter. At least not so with this new release, Koyasan. The German multi-instrumentalist was born on the cusp of a new world, in a small German town in 1945. As a young man, Georg Deuter worked for a brief time as a journalist before a near-fatal car accident lead him on a quest of the spirit and a life devoted to music, a quest that took him to study for many years in India before setting up home and a recording studio in the US southwest. Deuter is entirely self-taught, an admirable accomplishment when you consider the range of instruments he has mastered. He's most closely identified with the flute, but also plays keyboards, the tamboura (an Indian stringed instrument), cello, koto, and several others. Many of these are used to great effect on Koyasan, named after a sacred Buddhist mountain in central Japan, home to the Shingon sect of esoteric Buddhism and a UNESCO World Heritage Site. Except for the title and the presence of instruments associated with Japan, such as the shakuhachi (a bamboo flute) and the koto (a stringed instrument), and more widely with Asia (in this case, the 2-stringed Chinese violin, the erhu), the music on this album is not terribly suggestive of Koyasan. The song titles are generic enough to fit nearly any new age theme you'd care to choose. But the music . . . the music is sublime. The album features eight tracks, all but two 8 to 9 minute meditative excursions. There is no percussion, nor any noticeable rhythm, just languid journeys built on light and airy ambient washes, puffs of aural clouds through and around which circle the voices of the acoustic instruments. Unlike so many new age productions which work well in the background but can't withstand concentrated listening, Deuter's work, especially on this recording, will reward those who sit and listen attentively. My Introduction to Deuter, and what an Intro. Sheer brilliance in transporting my mind into another dimension of mental bliss, tranquility and harmony. The evocation of sadness in the title track underlines the sheer talent of this german maestro in understanding the human spirit and translating it into harmony. I tried this and some of his other titles in commute traffic and in stressful situations at work and found a perfect tonic to transport one into a state of mindfullness.